The GMDSS System; What Is It and What Does It Do? The GMDSS System - What is it? The Global Maritime Distress & Safety System (or the GMDSS System for short) was developed by the International Convention for the Safety of Life at Sea (SOLAS). Rightly concerned with the limitations of distress calls via VHF - short range, manual alert and dependency on aural watchkeeping - SOLAS called for the development of a more efficient approach to distress situations using modern technology and automation. As a result of the implementation of the GMDSS system, the 2182kHz listening watch aboard SOLAS ships ended on 1st February 1999 and the VHF Ch16 watch ended on 1st February 2005, since which the coastguard no longer has had a dedicated headset watch. 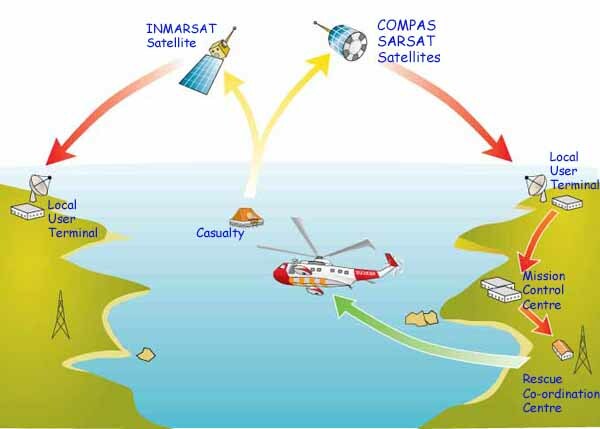 The GMDSS system involves geostationary satellites (INMARSAT ), Coastguard Shore Stations and Rescue Coordination Stations and it's this system that swings into action when the distress button is pressed on your DSC (Digital Selective Calling) enabled VHF radio. the Search & Rescue Transponder (SART) system. INMARSAT, the fully commercial non-government satellite network supporting GMDSS also provides a communication system accessible by dedicated mobile handsets (satphones). INMARSAT, founded in 1979, is the oldest satellite phone operator but other networks are now in place and operating. Of these, GLOBALSTAR and IRIDIUM are those most used by yachtsmen. Satphones, once the size and weight of a building block are now much like mobile phones, but rather more expensive. Outgoing calls from satellite phones to landlines and mobile phones are reasonably inexpensive, currently from around $0.15 to $2 per minute. Calls made from landlines and mobiles to satellite phones are very expensive for the caller - around $3 to $14 per minute - but free for the receiver. Making calls between different satellite phone networks is also notoriously expensive with calling rates of up to $15 per minute. This system provides navigational and meteorological information, plus other urgent safety-related information such as electronic chart correction data. MFI is broadcast through two independent systems - MF telex (NAVTEX) for local MFI and by satellite or HF telex (SafetyNET) for long-range MSI. The NAVTEX installation aboard sailboats normally comprises a receiver with a built-in printer and an external antenna, although there are a number of paperless units available which displays the information on a scroll-down screen. Typical range is up to 400nM. Two frequencies are used - 518kHz (international frequency) and 490kHz (national frequency), and being a line of sight system, NAVTEX may be difficult to receive when there's an obstruction between the transmitter and your antenna. NAVTEX transmissions are sent in English language from local stations situated worldwide. The power of each transmission is regulated so as to avoid the possibility of interference between transmitters. NAVTEX receivers can be programmed to receive specific message and reject others - ice reports for example being unlikely to feature strongly in the Caribbean. But navigational and meteorological warnings, and search and rescue information are non-rejectable to ensure that vessels equipped with NAVTEX always receive the most vital information. A SART, normally present on ships rather than cruising yachts, is a portable radar transponder intended for deployment from a liferaft. It will transmit a homing signal which shows up on the radar displays of ships and aircraft involved in a search and rescue mission as a series of 12 dots, indicating the required course setting to the casualty.